Yesterday we took a look back at Brian De Palma’s Mission: Impossible. The original movie was a critical and commercial success and the third highest-grossing film of 1996. No surprise then that director John Woo had a lot to live up to with the release of Mission: Impossible II. 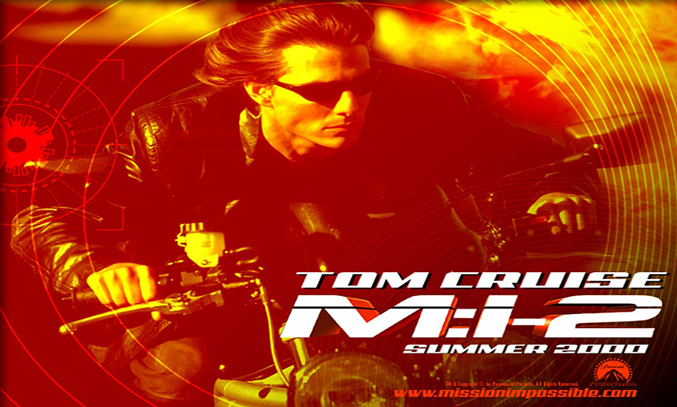 Mission: Impossible II (2000) sees Tom Cruise reprise his role as IMF agent Ethan Hunt. The plot centres around a genetically created disease called ‘Chimera’. Hunt leads his IMF team on a mission to retrieve and destroy the deadly disease but a former IMF agent Sean Ambrose (Dougray Scott) has already managed to steal the cure called ‘Bellerophon’ and now needs ‘Chimera’ to complete his grand plan of infecting the whole world. With time running out, Hunt must destroy the disease before the terrorists get their hands on it and find the cure to save his love interest Nyah Nordoff-Hall (Thandie Newton), who has already become infected. Disappointingly, Mission: Impossible II is considered by critics and fans to be the darkest and weakest installment in the series. Despite its strong thematic similarities with Alfred Hitchcock’s 1946 spy thriller Notorious, the film boasts barely any plot to speak and was described as “confusing”, “insulting” and “Mission: Implausible” by most movie critics. Join us tomorrow for look back at Mission: Impossible III.